In 1066, the land was pinched from the Saxon owner and given to a chum of William the Conqueror’s. The new Norman owner built a wooden ‘motte and bailey’ castle on the site. By the 12th century, the wooden fortifications were being replaced with stone ones. At various times, the owners changed because they had been executed, died on crusade, or in France, or it had passed through marriage to someone else. If the castle was in the north of England, south of Scotland, or anywhere in Wales, it was attacked, sometimes successfully, by the Scots, English or Welsh, as appropriate. If it was in the south of England, it might have been attacked by the French, or an unruly baron or two. 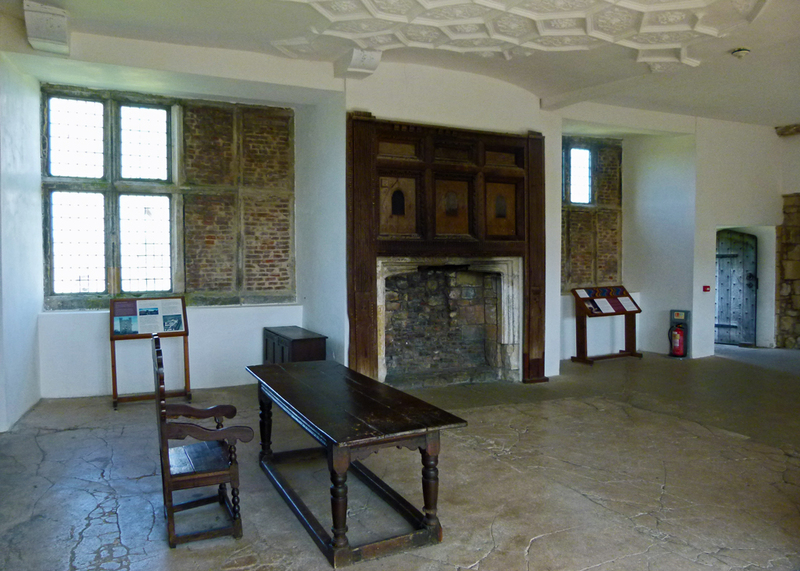 During Tudor times, it became less of a fortress and more of a family home. If it survived to the Civil War of the 17th century, it was probably besieged by Parliament/Royalists and was slighted so that it couldn’t be used any more. A century after that, it became a romantic ivy-covered ruin, painted by at least one famous artist, and a tourist attraction. I wondered if I was allowing my affection for ruined castles and the stories they can tell to get the better of me, so I checked out the comments on Trip Advisor. 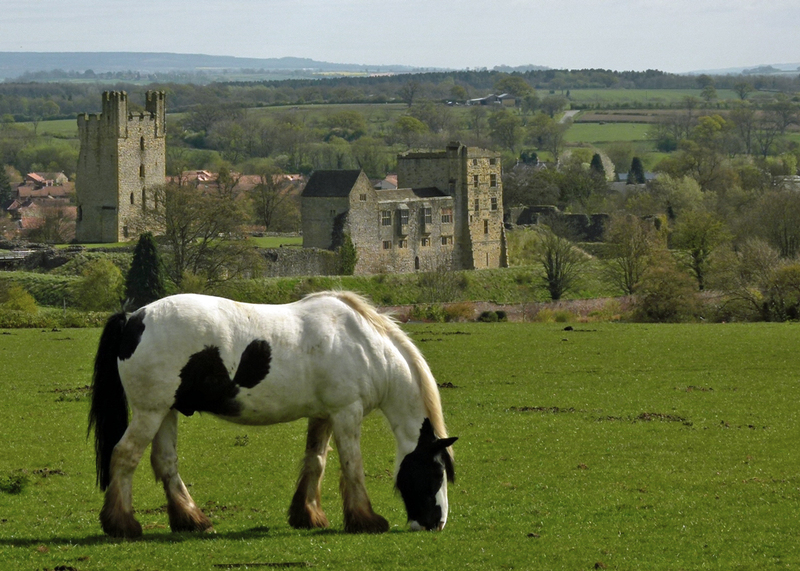 One person mentioned that Helmsley Castle is a good place for a picnic, and another pointed out, with no trace of irony, that it’s best visited on a dry day. I’m sure the founders of the castle would have been of the same mind. Robert de Mortain, William the Conqueror’s half-brother, was granted the small manor of Helmsley after the Normans had laid waste to huge areas in the north of England in 1069-70 – a vicious campaign known as the harrying of the North. So I like to imagine this brutal Norman knight, effectively an occupier, sitting on a tartan rug, idly picking at his Marmite and cucumber sandwich whilst Mrs Mortain pours him a dark brown, steaming, cup of tea from the Thermos. Nearby, the kids are playing Frisbee, their shouts of joy bringing grins to the scared faces of his men at arms. “A bit deeper with that ditch, there,” Robert calls good-naturedly to the group of contented workmen who were gaily building his new castle. “Good job the rain’s held off, dear,” he commented to his wife. “Perhaps we can get the barbie out later and have a couple of tinnies”. Robert of Mortain had fought alongside William at the Battle of Hastings and had been richly rewarded, with lands throughout the kingdom, though I have no idea whether he ever actually visited Helmsley. He seems to have spent most of his time in Normandy, though he may have instructed the digging of the two massive ditches at Helmsley which are similar to those at his castle in Berkhamsted. The owner of the Manor of Helmsley (Elmeslac in 1086, later Helmeslac and, sometimes, Hamlake), in the long-forgotten hundred of Maneshou, before Mortain was a Saxon called Uhtred, who seems to have owned several manors in the vicinity. I wonder what happened to him? An old man and full of days, quick-witted, prudent in council, moderate in peace, circumspect in war, a true friend and a loyal subject. His stature was passing tall, his limbs all of a size as not to exceed their just proportions, and yet to be well matched with his great height. His hair was still black, his beard long and flowing, his forehead wide and noble, his eyes large and bright, his face broad but well featured, his voice like the sound of a trumpet, setting off his natural eloquence of speech with a certain majesty of sound. The castle would have been built mainly in timber initially and was a simple defensive ringwork, without the classic Norman motte. When Walter Espec died, childless, in 1154, Helmsley passed via his sister to her husband, Peter de Roos. The de Roos, who held the castle until 1478, surely deserve to have someone in the family called Kanga. But they were a powerful family; the name is sometimes spelt Ros (pronounced Roos) and Baron de Ros is one of the oldest titles in Britain. Wooden palisades gave way to stone walls from about 1186, when Peter de Roos’ grandson, Robert Fursan de Roos, obtained Helmsley Castle. I have been unable to find out what ‘Fursan’ means – it might be Arabic and it might mean ‘knight’ – or it could be a place name. Robert was a member of the Knights’ Templar and one of the 25 barons appointed to help ensure King John kept to the terms of Magna Carta in 1215. He married the daughter of William the Lion, King of the Scots, and was buried in Temple Church, London. Successive generations of Rooses continued to improve the castle, building new chapels and improving the accommodation. In 1334, King Edward III paid a visit. During the Wars of the Roses, the de Roos family backed the Lancastrian side. Thomas de Roos III was captured after the Battle of Hexham in 1464 and beheaded in Newcastle. 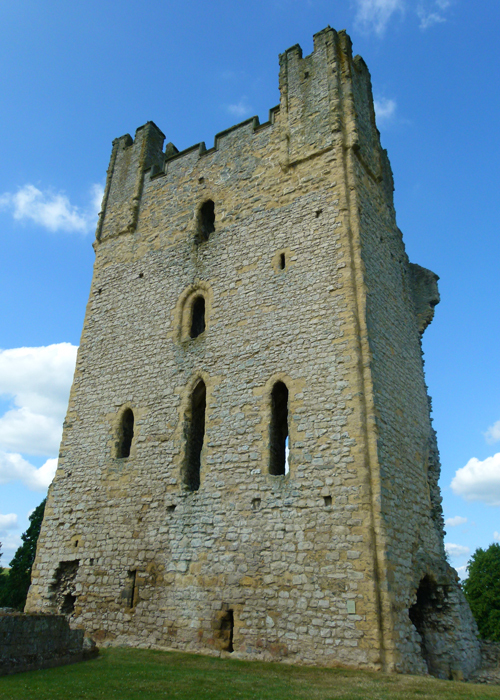 Helmsley was confiscated by the Yorkists and given to King Edward IV’s brother, George, Duke of Clarence. 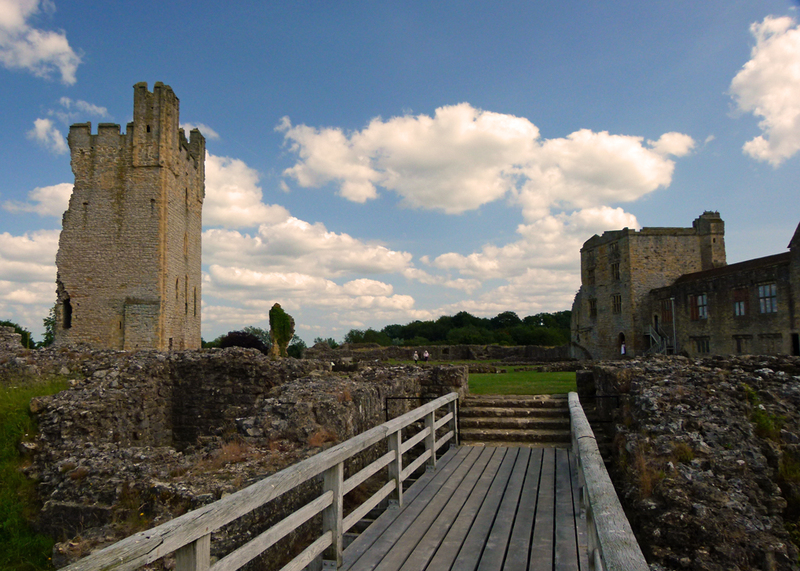 It then passed to the Duke of Gloucester, later Richard III – though Richard preferred his castle at Middleham. After Richard’s defeat at Bosworth, the victorious Henry VII gave Helmsley back to Thomas de Roos’ son, Edmund, but Edmund died without any heirs in 1508. And that was the end of the Roos. Helmsley Castle was then inherited by the Manners family, who became staunch Protestants and who demolished the old medieval hall and created a posh Tudor residence, including new apartments and a fashionable gallery, often re-using materials removed from the by now dissolved Rievaulx Abbey. The remains of the 16th century interiors can be seen today. In 1632, the castle passed via Katherine Villiers (née Manners), into the estate of her deceased husband, George Villiers, the Duke of Buckingham, hated favourite of James I and, later, his son Charles I. Buckingham was murdered 300 miles away in Portsmouth, in 1628. Like many castles in the North of England, Helmsley was held for the King during the Civil War and besieged by Parliamentary troops. This was Helmsley Castle’s one and only piece of action. The siege took place in 1644, from September to November, when the garrison eventually ran out of food and surrendered to Parliament’s talented general Sir Thomas Fairfax, ‘Black Tom’. He ordered it to be slighted – pulled down so that it could not be used again – though he spared the residential block. The 2nd Duke of Buckingham (another George) ended up marrying Sir Thomas’ daughter Mary in 1657, which might have been a neat ending, but George died in 1687 and the estate had to be sold to cover his debts. 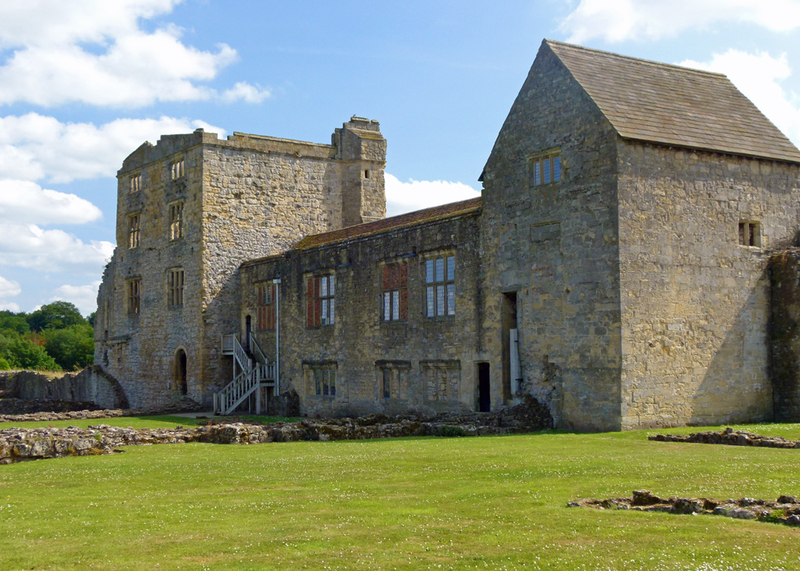 In 1695 Helmsley Castle was bought by wealthy London banker, Charles Duncombe, one-time MP and Mayor of London. The Duncombes still own the castle, but between 1711-1713 created a more sumptuous stately pile to live in nearby, Duncombe Park. In 1826, Charles’ descendent, Anthony Duncombe, was created Lord Feversham, a title that remains in the family. 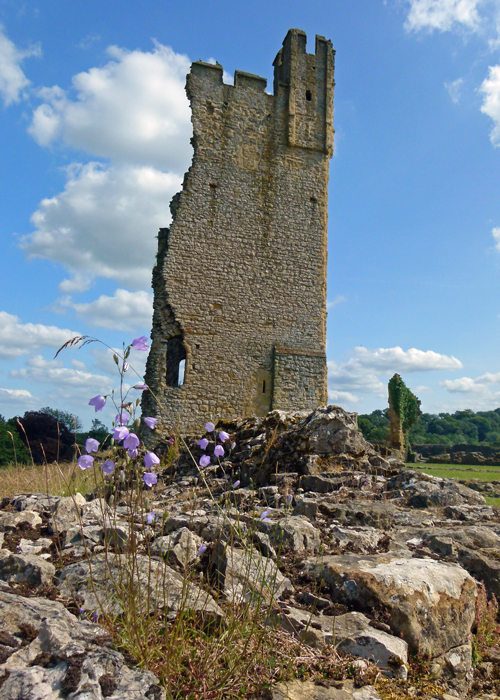 So Helmsley Castle’s ruinous state is due to Parliament and the fact that no one has lived there for more than 300 years. I wonder whether the reluctant visitor we met at the start appreciated the canter through history that Helmsley provides for those that want it. Not at the heart of men’s affairs in the way that, say, the Tower of London is; but nevertheless part of the wider tapestry of these islands. Somewhere linger the spirits of Uhtred, Robert de Mortain, Walter Espec, the de Roos, Manners, and Villiers. Even if you can’t picture the place as a working fortress and home, or under siege, the absolutely enormous ditches can’t fail to impress. With a bit of imagination, maybe you can rebuild the disintegrated masonry – even the soaring but slighted east tower with its fireplaces that would have heated long-forgotten rooms. 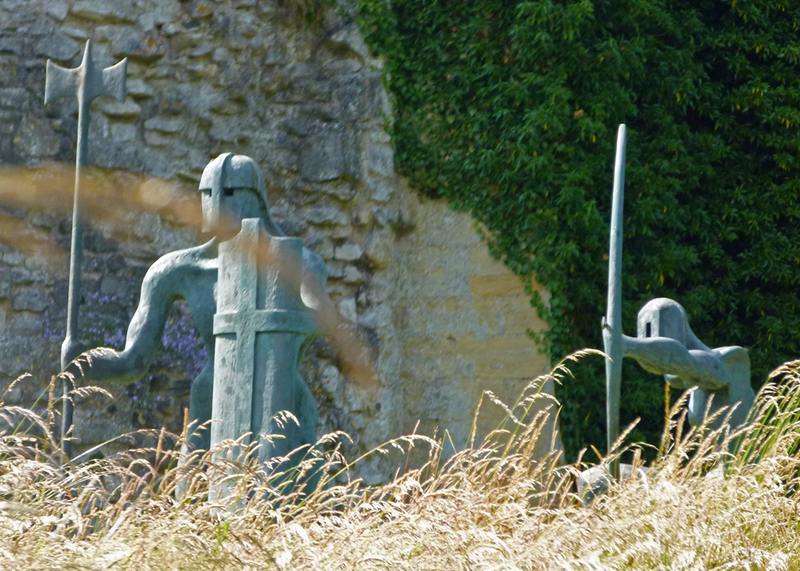 The castle entrance, through the intimidating south barbican, is now defended by stylised bronze sculptures of warriors, which I rather liked. The restored Tudor rooms in the chamber block provide a glimpse of the luxury that the Manners and Villiers families would have enjoyed and there’s a small, but interesting, exhibition of local finds – canon balls, domestic knick-knacks and the like. On top of that, the Castle is right next door to the town (or vice versa), a delightful and favourite place with several good pubs, where I confess to once drinking far too many creamy pints of Theakston’s Best far too quickly, followed up with rather too much Glenmorangie. The memory puts ‘ruin’ in a whole different context. This has made the bucket list – I love ruins and roaming around them. We seek them out when traveling in Ireland and England….it’s been far too long since we’ve been overseas. You’re so good at giving us the history of these places, whether the generic English castle history, or the specifics of this one. Makes the visit interesting, and the story is so similar from place to place. I do enjoy your posts so much, Mike! I can imagine you would be a wreck after all that beer and single malt whisky! Your photos are lovely, especially that last one! Well I think ruined castles always have a certain sense or feel to them, made even better if we have just read your most informative post. Some lovely photographs again and your last photo is stunning. Enjoy your dry sense of humor! Great tour of the ruins with history lesson included. Always have a good read when I stop by your blog. Love that Mortain family vignette. I’m hoping that the cranky visitor to Helmsley simply had a dry sense of humor. 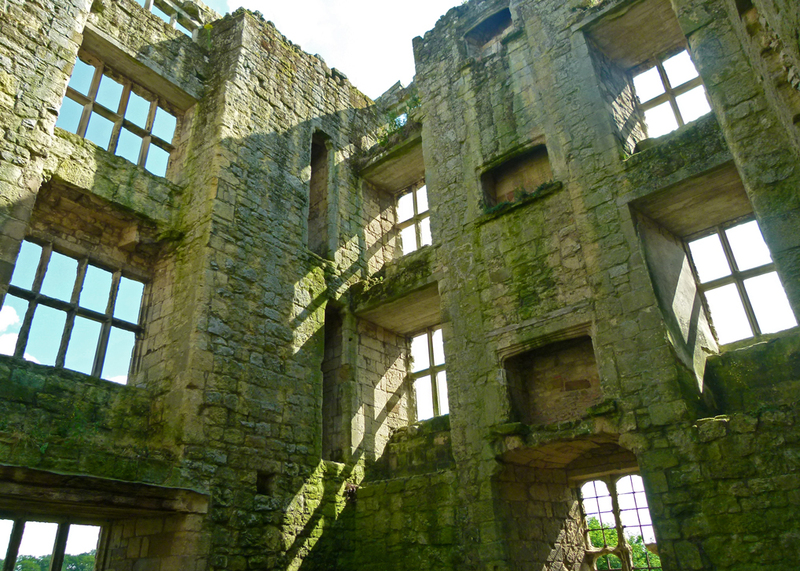 I loved visiting Helmsley Castle and my favorite photo from that day is the sunlight window reflections on the keep. But your last photo is just stunning. I’d like that on my wall! Wow! 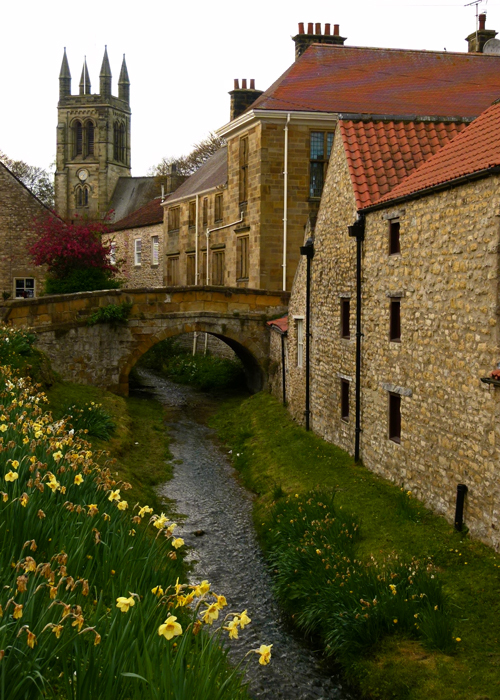 Helmsley looks good in March! Such lovely photos, Mike! Many pretty views, and I like the knight statuary. But the best part is your generic tourguide description – you nailed it! As always, a fascinating post with wonderful photos. I’ve never been familiar with this castle so it was extra interesting to me! And you tell the stories so well! 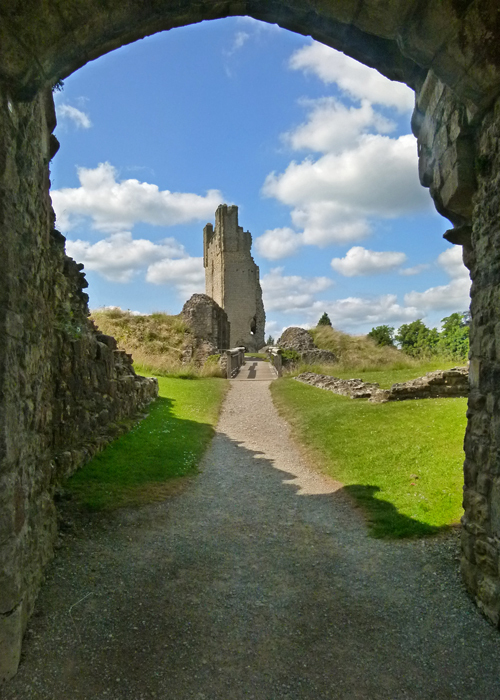 Growing up in Britain, I loved the history that accompanies the ancient castles, and I always enjoyed visiting the sites and learning about the battles and previous occupants. It seemed normal to have a history going back 1000 years or more. But here in Canada, if something is 150 years old, well, that’s OLD! Helmsley is definitely worth a visit, no matter the weather. But of course it all looks much more attractive and is more fun to explore in the sunshine. Many years ago we visited the castle, but I can not remember the Tudor rooms; maybe that part was made accessible to visitors later. Two years ago, we were in town again but didn’t make it to the castle. If you are interested, my blog post about that visit is here. Looks like a pretty decent place to visit, which I’m sure you totally enjoyed. Wonderful views and the photos look great. Greetings! Even as a ruin, the place has character. Terrific pics! We once stayed in Helmsley but for some reason we didn’t quite make it inside the castle. From your description it sounds very interesting. 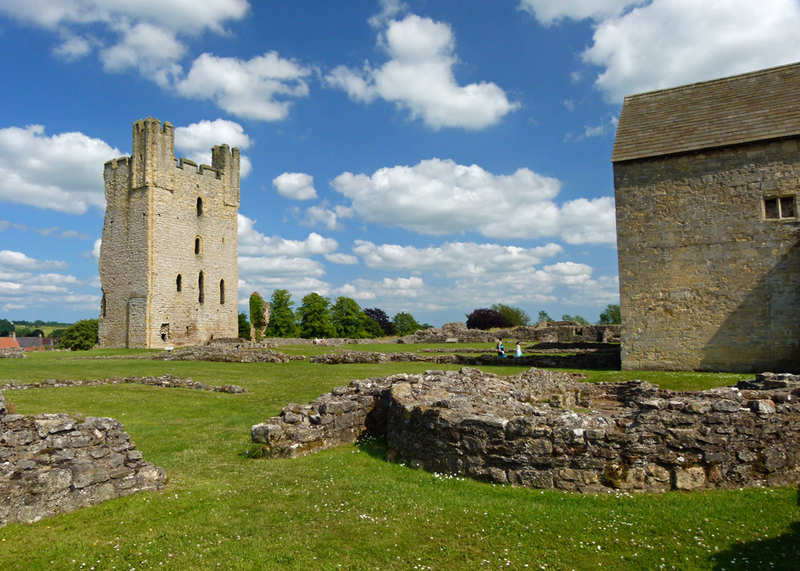 A very thorough look at Helmsley Castle, Mike. I enjoyed reading through it and being reminded of our visit there last year. (My husband’s a Yorkshireman, so we spend a lot of time up there.) It’s sad to think of just how many beautiful castles were slighted after the Civil War.